All things considered, there are many people I need to thank. People who I expected to help me understand concepts that were new to me. People who I can learn from. People that have been so focused on pursuing an ideology I have difficulties understanding. The first people I turned to were blunt: my Métis identity was akin to fraud. Worse, it was Indigenous Appropriation. But, and very importantly, they never asked me what I thought I knew about where I come from, who my ancestors are, what oral history was passed to me. We have a hard time shedding Colonialism when speaking to each other, and request – nay – DEMAND empirical proof. Oral history? Pfft. 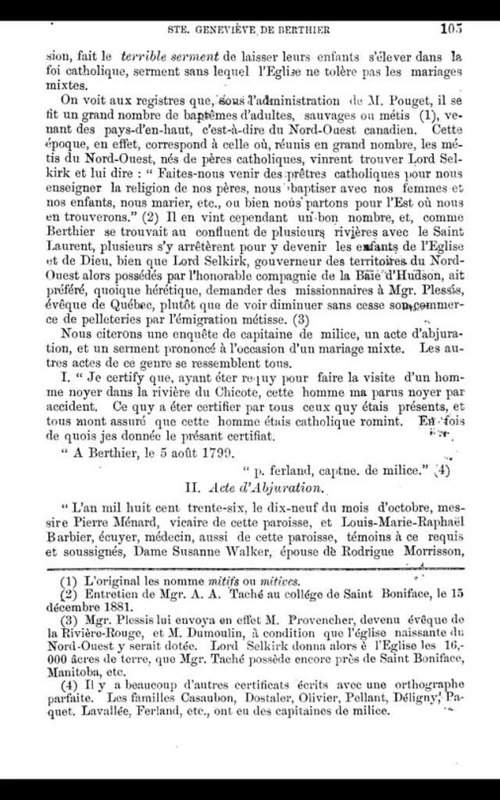 The page above is from a book published in 1889 about the Parish of Berthier. 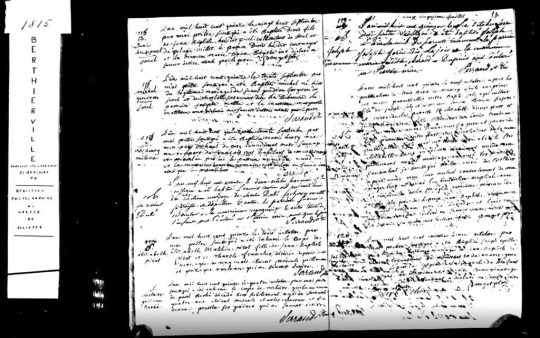 Page 105 is a review of the Church records during the tenure of Jean-Baptiste-Noël Pouget, between 1777 and his death in 1818. It explains that during this period, a great number of baptisms of adults, *savages* and métis from the North-West territories. The author’s explanation is the confluence of the many rivers surrounding Berthier, which is situated fairly East of Montreal – which would have been much closer to the Métis coming from the Red River area. But genealogical records can show that the North-West Métis had kinship living along the rivers leading to Berthier: first cousins, uncles, aunts, grandparents. 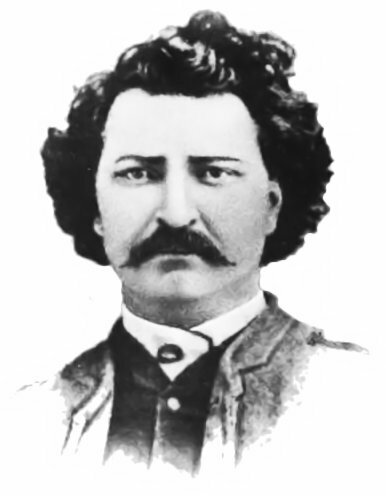 Although Pouget seemed sympathetic to Métis, the Church discouraged mixed unions, which may explain why the parents were never named. The baptisms were entered in the records as born of a Canadian father and an Indigenous mother. Almost two dozen of such records have been located so far in the Berthierville church records. So, there it is. The empirical proof of a link. Because the oral histories weren’t enough. Because the Métis sash made in L’Assomption wasn’t enough. Because the kinship memories weren’t enough. But again, thank you. This experience has given me the opportunity of meeting people that do care, who I can learn from. And who I hope will be around my daughter for years to come. Not all Québecois are #Métis. For some time now, there’s been discussions about the ethnogenesis of the Métis People of Canada. 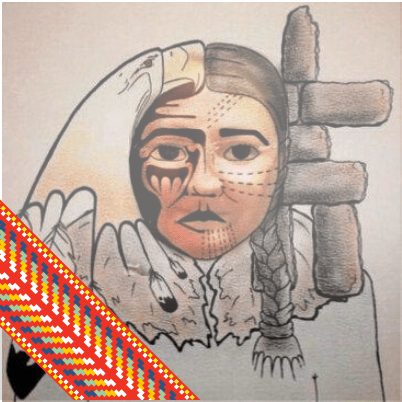 There are many opinions, and many people have much to gain for people currently not included in the definition of Métis as described by the Métis Nation of Canada. I won’t speak about other narratives and I won’t arrogate an opinion on others. Although I benefit of the Privilege of being a White-passing Métis, I strive to decolonize my mindset every day. I have written in past posts (here, here, here, here ) the reasons behind this blog. (which I describe as ”where I come to ponder about MY Métis identity and what it all means for me and for future generations…) I feel the need to document my memories, the memories of my dad, my grand-parents and my great-grand-parents. Why? Because I heard them first-hand, they were oral and when I’m no longer here, I want it documented. It’s important to me for my children, my future grand-children and my future great-grand-children for so many reasons, and “oral narratives” are discounted. So I’m writing them down, here. Nobody else need to agree with me. I’m not the Courts and it’s not a debate. Identity is a moving target, and I’ve seen many Indigenous groups having to resort to historical documents because their identity relies on Court decisions. To me, it is the most Colonialist gesture enabling the erasure and assimilation of Indigenous minority groups. To me, it’s like a little bit of Indigenous Persons living on the fringe gets cut off every time the numbers of that group gets small enough not to benefit from research or pecuniary interest. Sigh. I’ve got so much to say about that. But, to be brief: not all people from Québec identify as Métis, have ancestors who were *Indians, are from a historical community. 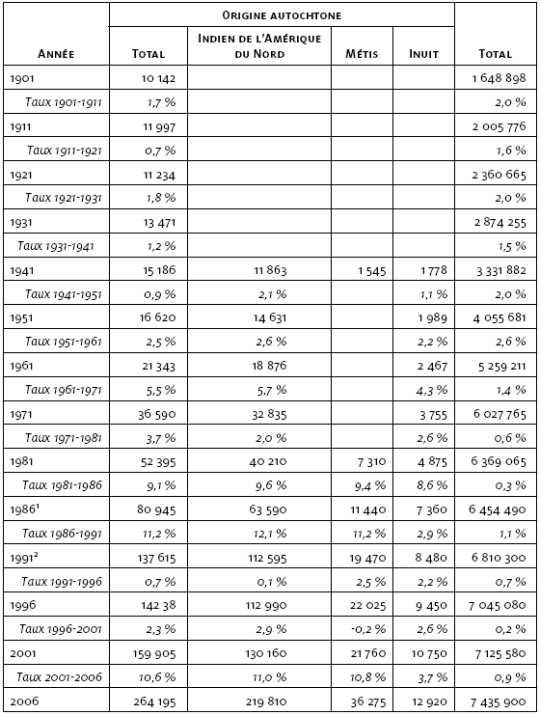 And last, but not least, not all Métis of Québec identify as Québécois. Again, only speaking for myself here: I don’t, nor have I ever, identified as Québécois. The ways in which I have understood my family’s history has always led me to understand that my identity was more *fluid* (for lack of a better word) than just Québec. My ancestors and their kin were travelers. Voyageurs. They were impervious to borders that shifted so much prior to Confederation. They came and they went. They traveled for the fur trade. They came back. They eventually settled. They didn’t settle along the Red or the Assiniboine Rivers. They chose other rivers: Saint-Maurice, Mastigouche, L’Assomption, Bayonne, Ouareau, moving up the rivers away from the population growth along the Saint-Lawrence. Many assimilated, like First Nations did, I’m sure. How else would the province with the second largest population has the second smallest population by percentage in Canada? It’s gonna be hard to prove to the Courts that Lanaudière and/or Mauricie are historic communities, because there’s nothing to gain. No oil, no natural gas, no bituminous sands. Just water and forests and farmland. Representation needs money (I’m hearing Kevin O’Leary yelling this), and money expects a return on its investment. If I can’t call myself Métis, who can? I’m still obsessing over questions regarding identity, community, kinship and blood-quantum in my own quest to reclaim my own identity. I’m also meeting so many interesting people along the way who are experiencing a similar internal questioning. What strikes me most is the battle for identity is so personal and a very intimate journey, yet is so overshadowed by a public battle over land and hunting rights. And this war is leaving deep wounds. Inclusion to an official Indigenous Membership vs Settling in with the Settlers. So – Academics and Policy Makers, be kind. There are people being hurt, no matter how the pie is sliced. Don’t be an insensitive douche when extolling the virtues of your opinion. Everyone’s reality is as real as yours. Remember the bias of perception. That being said: I don’t know who has the “right” to call oneself Métis. It is not for me to say. But I sure as hell know that I do. 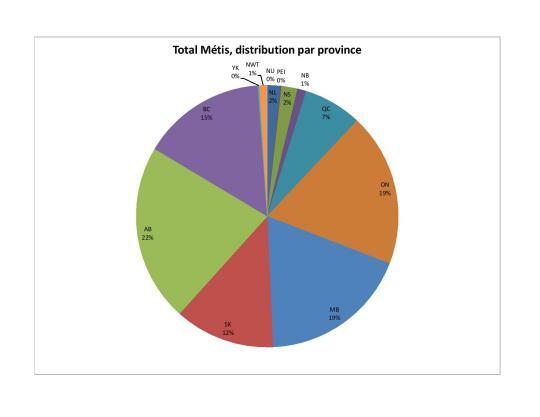 The word Métis comes from the very region where I’m from. Like the Riel, Dubois, Lagimodière, Parenteau, etc..etc…etc… Believe me – or don’t – but we called ourselves Métis before 1982; we called ourselves Métis before 1885. I won’t be cruel to kin (even if they are to us) and accuse THEM of appropriation. But I’d like to invite them to examine the facts.